I often feel like I don't take advantage of the recipes on Rachael Ray's talk show enough, but there are just so many of them! And not all of them are 30 minute meals, so it does take a bit more research to find one that will work. 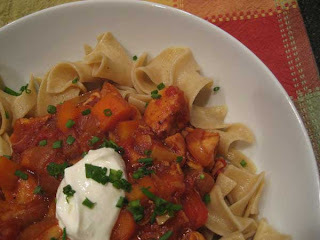 I definitely found one that worked when I found the recipe for Paprika Chicken Stew with Potato Pierogies. Even before I found out that I had gestational diabetes, we tried to steer towards whole grains, so I used the suggested egg noodles (whole wheat) instead of the potato pierogies. (I made this meal before my GD diagnosis, but I bet I could still eatit as long as I limited the amount of noodles I ate....). Although, I think it would be pretty darn good with the pierogies, so I might give them a try next time. Place a large pot of water over high heat and bring up to a boil for the pierogies. Place a large Dutch oven over medium-high heat with 1 turn of the pan of EVOO, about 1 tablespoon. Add the bacon and cook until brown and crisp, about 2-3 minutes. Season chicken pieces with salt and pepper, add to the pot with the bacon and brown all sides, about 5 minutes. Add onions, carrots and garlic, paprika, cumin, marjoram and bay leaves, and cook for about 4-5 minutes, until the veggies are tender. Make a well in the middle of the pan and add 2 tablespoons of EVOO. Add the flour to the EVOO and mix to form a paste. Add the white wine, scraping up all of the brown bits on the bottom of the pan. Add the chicken stock and tomatoes, and cook for about 20 minutes until the stew has thickened. While the stew is cooking, cook the pierogies according to the package directions. Drain and coat lightly with EVOO so they do not stick together. Heat a medium-size nonstick skillet over medium-high heat, add the butter and cook until butter turns slightly brown and gives off a nutty smell. Make sure not to burn the butter though! Add the cooked pierogies to the pan and cook until slightly browned on both sides, about 1-2 minutes per side. Serve the stew in large bowls topped with a tablespoon or so of sour cream and some chopped chives with a sprinkle of lemon zest, rosemary and parsley. Place the pierogies on top of the stew and eat!